The CPMR Baltic Sea Commission took part in the 2018 Baltic Sea Future congress in Stockholm on 8-9 March, to discuss opportunities for long-term sustainable collaboration for the Baltic Sea Region. The Baltic Sea Future congress is an annual forum connecting local and regional authorities with researchers, entrepreneurs and investors. Together they discuss joint solutions for a healthy and sustainable Baltic Sea. The Congress provided a great opportunity to highlight the efforts and innovative environmental solutions developed by regional authorities surrounding the Baltic Sea. During the event, several innovative renewable energy initiatives undertaken by regional authorities were showcased. 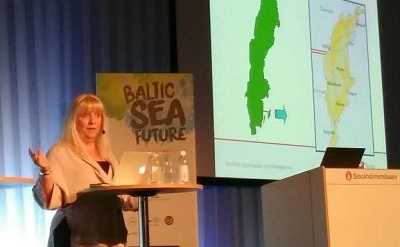 Ms Meit Fohlin, member of the CPMR Baltic Sea Commission and Mayor of Gotland Region, presented her island’s ambition to make Eco-municipality of Gotland fossil free by 2025. By 2020 the objective is to ensure a 100% renewable energy supply for households and businesses on Gotland. In the early 1990s, the municipality started the work to turn the island into a sustainable society by 2025, meaning it will have sustainability in relation to energy, resources, agriculture, waste etc. In particular, the Gotland regions wants to be greenhouse gas emission neutral within one generation. Ms Fohlin stressed that the island as a whole, fuel production and local energy supply from renewable resources are increasing. Local wind power meets about 50% of the island’s annual electricity demand. More information on Eco-Municipality Gotland can be read here.